There are many different personality types in horses: some are overachievers, some are hot, and certainly some are, by nature, lazier than others. These horses can make you feel like you are working yourself to death just to keep them loping. They are slow to respond to cues, hard to get quick responses out of, and you can struggle achieving proper drive and forward motion. They have a tendency to be so ready to quit driving forward that they are the prime candidates for hitting their front end during a stop. Along with these seemingly negative traits, come a number of positives: these horses are usually less spooky, they rarely bolt, and if you can get them going forward properly, can be good stoppers. This is a personality type that a lot of reining trainers prefer in a horse. I have a couple of horses that tend to be sluggish. My roan stallion, Laddie, is a prime example. He is a gorgeous loper, huge stopper and has a generally cool demeanor. For maneuvers like a spin, though, teaching him to add speed was challenging. He was willing to be kicked on rather than to speed up. I cannot spin him using my leg for acceleration. I have to start him in his spin, put a lot of life in my body, and then always quit him when he has stepped it up a gear. If I kick him for that, he will simply stiffen up and take my kick. Instead, I cluck to him and if he doesn’t gear up, I use my rein on his shoulder. Now, he is quite willing to step it up from just a subtle cluck. Changing your mind set with this type of horse is probably the most crucial thing for success. When you are riding or training a numb horse, it can be easy to fall into the habit of taking a hold of them or kicking them harder because they feel numb. In those moments it is easy to forget that the heaviness or softness in a horse is not a physical trait, but a mental trait. Even though it feels right to handle the numb horse harder, lightness is actually more important in these horses than with a more reactionary one. With a sluggish horse you must always ask with the lightest of cues and enforce with a quicker and harder correction. They are often willing to take that grey area amount of pressure rather than do what you are asking of them. 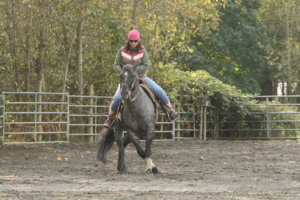 For example, if I am asking my horse to accelerate, I will cluck to him and gently squeeze my legs. I give him a moment to respond, and then I will more aggressively over-and-under him with my reins. The next time I ask, I will go back to the very lightest of cues. I graduate my pressure faster with this horse, but I am more careful to preserve the initial cue. I won’t bother with the in-between steps of pressure because they are ineffectual with these horses. I will focus harder on making my horse understand what I am asking and avoid physically dragging him there. I also keep a lot of life in my body with a sluggish horse. I don’t know how to describe it other than keeping my energy up; an almost electric feel inside without being too quick or heavy-handed. This helps to liven up this type of horse. Also, find opportunities to open him up and let him run. Always end maneuvers when he is being quick or energized. For example, quit this horse in his turn-arounds at the peak of speed, being careful not to let him gear back down before you quit him. Horses like this can be easier to train for most people due to the simple reason that their lazy nature makes them seek the relief more than another horse. They are the perfect horse for making the wrong thing hard and the right thing easy. Always give these horses the opportunity to do the right thing and get that release, but be very clear about making the wrong thing more meaningful. Make your training of this horse very black and white and you will find that he becomes lighter and more agreeable with each ride.